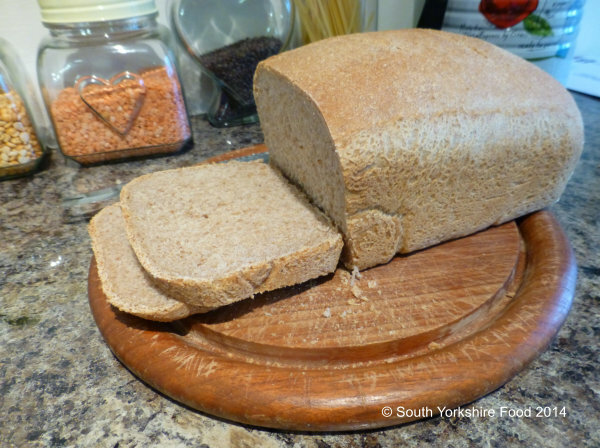 There is nothing like the taste of home made bread! This loaf is very easy to make - you just need a little time to let it rise. I usually start it after breakfast and it is then ready for lunch time. Eat it with some nice cheddar cheese or a bowl of warming soup. Ideal for an Autumn lunch. Mix the flours and salt together, and then mix in the dried yeast. Gradually add the warm water and mix into a dough. Knead for approximately 10 minutes until the gluten in the dough begins to develop. If you use a mixer with a dough hook, knead on a high speed for about 8 minutes. You can tell if the dough is ready by doing the windowpane test. When the dough is ready place in a bowl and cover the bowl with some oiled kitchen film and leave to rise for about 1½ hours. It should have at least doubled in size. Now gently knock back the dough with your hand and gently shape the dough into an oblong that will fit into your bread tin. If you don't have a bread tin shape the dough into a round and put on a baking tray covered with baking parchment. Leave the dough to prove and has approximately doubled in size. Using a sharp knife, gently put a couple of slashes across the top. Heat the oven to 220C/200C Fan/425F. Bake the loaf for 35-40 minutes until golden brown. It should sound hollow when tapped.